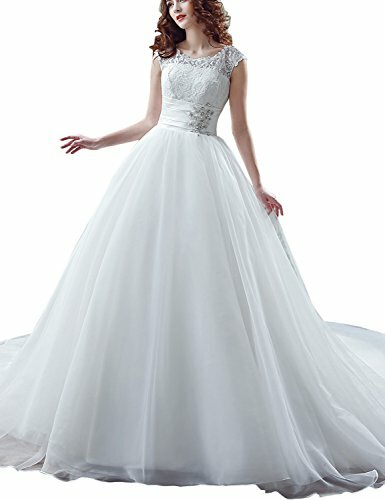 Sarahbridal Women's Lace Tulle Wedding Dress A-Line Brial Gown with Crystal Ivory US12 | What Should I Say? "Sarahbridal" is an US registered brand and is owned by company Sarahbridal Collection Inc. "Sarahbridal" is a high-end product line and provide formal social occasion gowns for the upscale, high fashion woman. The Sarahbridal Collection of prom gowns and formal dresses is adorned with plush details of lace, rhinestones, artistic embroidery and exquisite draping. Formal ball gowns, mermaid dresses and slim sheaths in an array of colors allow The Sarahbridal Collection to be worn for a variety of special occasions. Beautiful gold embellishments with sparkling rhinestone on body. The top is a sheer scoop neck that extends to the back, making the entire top half of the gown see-through and slightly scandalous. You'll need to measure the fullest part of your bust (NOT bra size) to get the proper measurement . Bend to one side and find your waist's natural crease. At the crease, measure around your waist, making sure that the measuring tape is a bit loose. You can also find your natural waist by measuring 2 inches up from your belly button. Keep in mind that size charts tend to be different for different styles, you can use the size chart as a basic guide. Always choose the larger size if your measurements come between two sizes. Avoid the dress size generators, as they tend to give you the wrong sizes.